Also commonly called Stray Current corrosion; it's the systematic removal of the protective layer on the inside of the radiator tubes and other components. It is a killer of cooling system components usually is quite localized and in severe cases will destroy radiators and heaters in weeks. 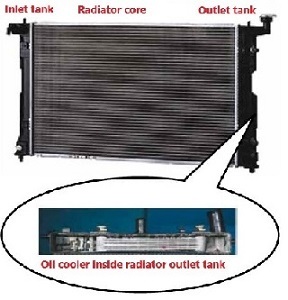 Previously A1 has provided details and interesting facts relating to cooling systems. We have discussed coolant and compatibility and electrolysis or stray electrical current, both of which have a major effect on cooling system performance and life span. 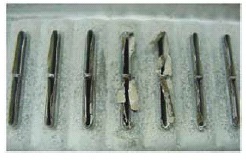 Now I want to share our experience on cavitation corrosion which is also a silent killer of cooling systems. Coolant Colours - What is the difference between red and green? OE manufacturer's state there is a difference but they make it difficult to ascertain what it actually is and this may be for commercial reasons rather than anything else. What we do know is most coolants have varying freeze and corrosion protection. They therefore have different levels of glycol and/or corrosion protection additives. The need to test for any stray currents in the cooling system is imperative. Stray currents can cause premature corrosion failures in radiators, water pumps and thermostat housings as well as premature ageing in coolant hoses. When we say premature, we mean in as little as three months. Today's high tech air induction systems are designed to optimize engine efficiency and decrease emisisions across a wide range of operating conditions and loads. The charge air cooler (CAC) is a critical component of that system. Increasing engine boost, through the use of increasingly efficient turbo-chargers and charge-air coolers, permit smaller and lighter engines to deliver the equivalent horsepower of older, larger, and heavier engines. Today's vehicle manufacturers and their leading suppliers, are involved in a variety of research and product development efforts designed to improve vehicle performance and reduce costs through improved thermal management products. With a European phase out of current day automotive refrigerant, HFC-134a, scheduled to begin in 2011, the global auto industry has not decided on the next generation gas. The further for shop owners and technicians looks like a future of two gases - one for US, Asian and some European built vehicles and another for german makes. 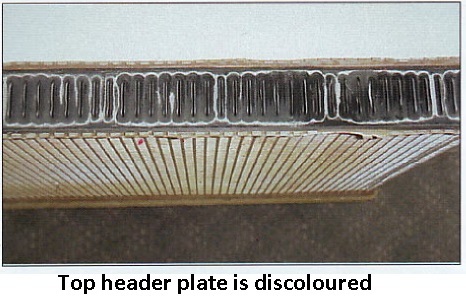 Contamination or foreign matter inside the radiator is commonly found in radiators that we see in our workshop for assessment and repair. What is corrosion? 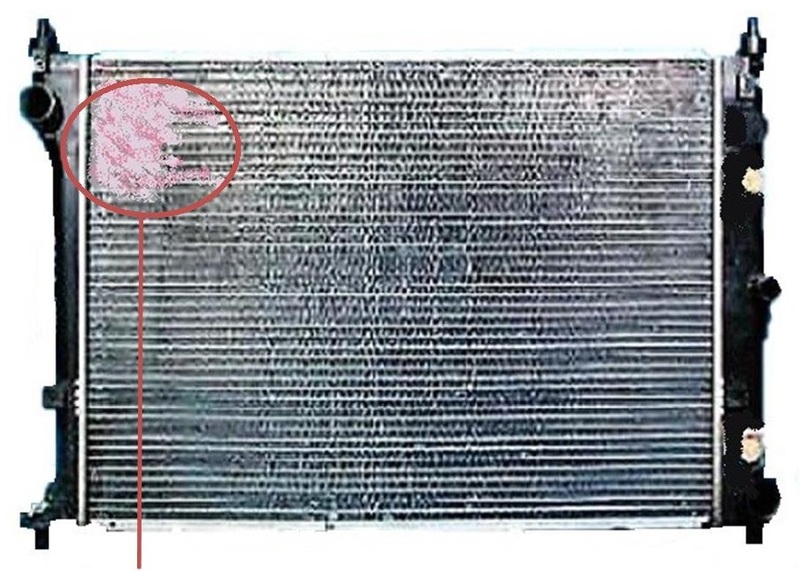 The mechanical and chemical deterioration of the radiator's tubes and header plates, leading to holes in the tube to header joints and cracks in the core. 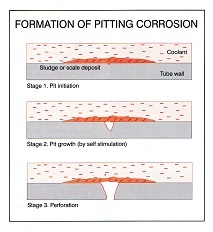 This corrosion are known as Pitting Corrosion and Galvanic Corrosion. 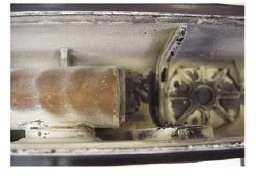 Oil Cooler failure is often caused by pitting corrosion. 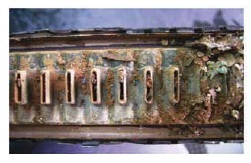 This type of corrosion is not limited to the oil cooler and can also attack the tubes and header plates of the radiator. 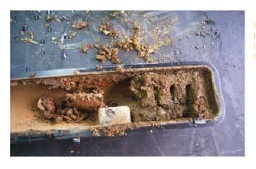 Also commonly called Stray Current corrosion. 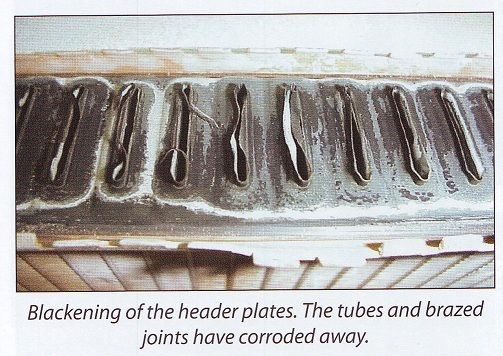 Electrolysis is the systematic removal of the protective layer on the inside of radiator tubes due to improper grounding. Thermal shock, the uneven expansion of materials, is created when the coolant temperature fluctuates rapidly & repeatedly. 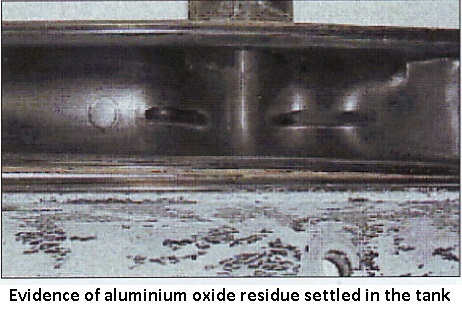 Thermal shock typically affects tubes near the inlet side of the radiator. Your radiator cap keeps the coolant level in the radiator at the desired amount. 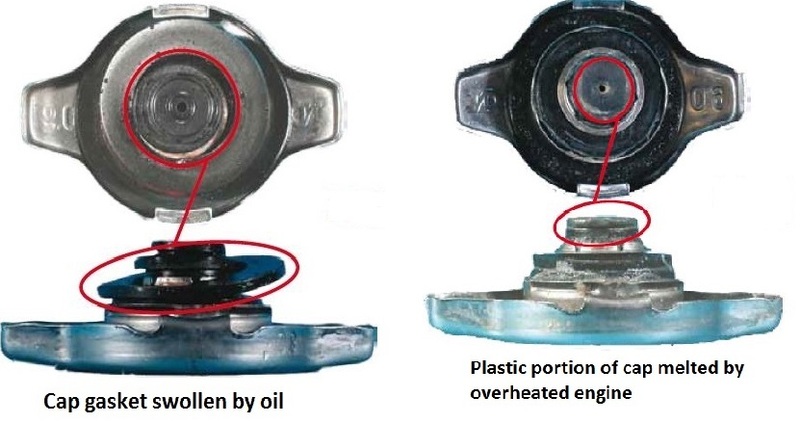 The cap releases coolant to the over flow bottle at a certain pressure, then draws it back as the engine cools, to maintain the correct coolant level.